Bolivia's government has announced it plans to allow "excess" coca growing but will buy it up to prevent it being used to make cocaine. The move follows a fairly dramatic earlier announcement that the nation is actually withdrawing from the UN Single Convention on Narcotic Drugs over the treaty's ban on traditional coca products. Only slightly dramatic, though; they are planning to rejoin in a year, agreeing to everything except for the coca ban, and to continue "fighting drug trafficking" in the meanwhile. Drawing a distinction between high-potency cocaine vs. natural coca leaves and the teas, candies and soaps made from it is fair. 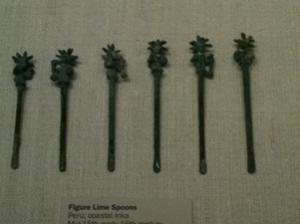 So is the claim of coca use being a tradition going back thousands of years -- visit any museum with an Andean collection and you'll likely see high-end, ancient spoons and containers used to dispense lime powder used by coca chewers to extract alkaloid from the raw leaves. Whether the promise to "fight trafficking" is sincere depends on what one means by that. Bolivia will continue to carry out law enforcement operations to interdict illicit cocaine shipments, to find and destroy illicit coca fields, maybe even to break up criminal operations. In that sense Bolivian Pres. Evo Morales (an indigenous Bolivian and himself a coca grower) is as sincere as our leaders are here in the United States. If the question, however, is whether such exercises are actually useful, decades of data say they are not. Coca growing has undergone large shifts over the decades between the three major producing countries -- Bolivia, Colombia and Peru -- but with the total from the three countries combined staying relatively constant. Drug warriors in the US and at the UN have touted a drop in recent years in the estimated number of hectares (10,000 square meters or 2.47 acres) being used to grow illicit coca for the cocaine trade. But all that means is the coca is more potent now -- less growing is needed to produce the same amount of cocaine. As long as Bolivia goes through those motions, they can minimize the pressure and criticisms brought to bear by drug warriors in other countries from their treaty move. Leaders in those other countries, the US principally, can in turn avoid political flack or annoyance thereby as well. In this way Morales may succeed in taking the pressure off of both his fellow cocaleros and his administration -- liberalizing coca policy is a good thing. But for the many victims of drug trafficking -- the young and old massacred each week in Mexico, for example -- only the whole truth will one day free them. And the whole truth of drug policy is that prohibition causes violence, costs money and lives and doesn't work, all the politically cautious displays of cooperation notwithstanding. The Office of National Drug Control Policy (ONDCP -- the drug czar's office) Monday released this year's version of the annual guiding federal document on drug policy, the 2011 National Drug Control Strategy, and there's not much new or surprising there. There is a lot of talk about public health, but federal spending priorities remain weighted toward law enforcement despite all the pretty words. The strategy identifies three "policy priorities": reducing prescription drug abuse, addressing drugged driving, and increased prevention efforts. It also identifies populations of special interest, including veterans, college students, and women with children. The strategy promises continued strong law enforcement and interdiction efforts, including going after the opium and heroin trade in Afghanistan and cooperating with Mexican and Central American authorities in the $1.4 billion Plan Merida attack on Mexican drug gangs. "Drug use affects every sector of society, straining our economy, our healthcare and criminal justice systems, and endangering the futures of our young people," said ONDCP head Gil Kerlikowske in introducing the strategy. "The United States cannot afford to continue paying the devastating toll of illicit drug use and its consequences." This is all standard stuff. One thing that is new is ONDCP's felt need to fight back against rising momentum to end the drug war, or at least legalize marijuana, and rising acceptance of medical marijuana. The strategy devoted nearly five full pages to argumentation against legalization and medical marijuana. "Marijuana and other illicit drugs are addictive and unsafe," ONDCP argued in a section titled Facts About Marijuana. "Making matters worse, confusing messages being conveyed by the entertainment industry, media, proponents of 'medical' marijuana, and political campaigns to legalize all marijuana use perpetuate the false notion that marijuana use is harmless and aim to establish commercial access to the drug. This significantly diminishes efforts to keep our young people drug free and hampers the struggle of those recovering from addiction." Just to be clear, ONDCP went on to say flatly "marijuana use is harmful," although it didn't bother to say how harmful or compared to what, nor did it explain why the best public policy approach to a substance that causes limited harm is to criminalize it and its users. ONDCP also argued that despite medical marijuana being legal in 16 states and the District of Columbia, "the cannabis (marijuana) plant is not a medicine." Somewhat surprisingly, given that the DEA just days ago held that marijuana has no accepted medical use, the national drug strategy conceded that "there may be medical value for some of the individual components of the cannabis plant," but then fell back on the old "smoking marijuana is an inefficient and harmful method" of taking one's medicine. "This administration steadfastly opposes drug legalization," the strategy emphasized. "Legalization runs counter to a public health approach to drug control because it would increase the availability of drugs, reduce their price, undermine prevention activities, hinder recovery support efforts, and pose a significant health and safety risk to all Americans, especially our youth." It was this section of the strategy that excited the most attention from drug policy reformers. They lined up to lambast its logic. "It is encouraging that ONDCP felt a need to address both medical marijuana and general legalization of the plant in its 2011 strategy booklet, which was released today," noted Jacob Sullum at the Reason blog. "It is also encouraging that the ONDCP's arguments are so lame… The ONDCP never entertains the possibility that a product could be legal even though it is not harmless. Do the legality of alcohol and tobacco send the message that they are harmless? If you oppose a return to alcohol prohibition, should you be blamed for encouraging kids to drink and making life harder for recovering alcoholics? ONDCP director Gil Kerlikowske may have renounced the use of martial rhetoric to describe the government's anti-drug crusade, but he still manages to imply that reformers are traitors whose 'confusing messages' are undermining morale in the nation's struggle against the existential threat of pot smoking." "It's sad that the drug czar decided to insert a multi-page rant against legalizing and regulating drugs into the National Drug Control Strategy instead of actually doing his job and shifting limited resources to combat the public health problem of drug abuse," said Neill Franklin, director of Law Enforcement Against Prohibition. "Obama administration officials continually talk about the fact that addiction is a medical problem, but when our budgets are so strained I cannot understand why they're dumping more money into arrests, punishment and prisons than the Bush administration ever did. The fact is, once we legalize and regulate drugs, we will not only allow police to focus on stopping violent crime instead of being distracted by arresting drug users, but we will also be able to put the resources that are saved into funding treatment and prevention programs that actually work. Who ever heard of curing a health problem with handcuffs?" 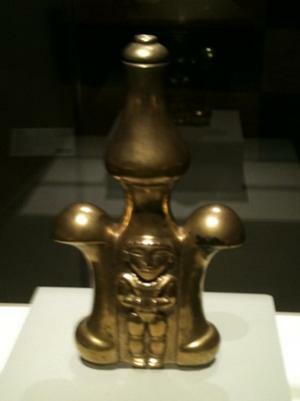 Some reformers offered a broader critique of the strategy. "Other than an escalating war of words on marijuana, it's all pretty much the same thing as last year," said Bill Piper, director of national affairs for the Drug Policy Alliance. "There's nothing really new here, except they are a bit more punitive this year," he added, citing the pushback on marijuana, the call for a drugged driving offensive, and a call to encourage workplace drug testing. "Last year, it was more about reform, but this year ONDCP is up to its old tricks again. Whatever window they had to turn over a new leaf is closed; Kerlikowske has been fully captured by the drug war establishment." The Obama administration could pay a price for its intransigence on drug policy, said Piper. "They badly underestimate the American people and the drug reform movement, especially on medical marijuana," he said. "It's not just the strategy, but the DEA refusal to reschedule and the Department of Justice memo, too. They are talking about coming out big against medical marijuana, but I think they know there is little they can do. In a sense, this is an act of desperation, a sign that we are winning. First they ignore you…"
The veteran drug reform lobbyist also professed concern about the drugged driving campaign. The strategy sets as a goal a 10% reduction in drugged driving (although it doesn’t even know how prevalent it is) and encourages states to pass zero tolerance per se DUID laws that are bound to ensnare drivers who are not impaired but may have used marijuana in preceding days or weeks. "We are concerned about getting states to pass those laws," he said. "They are problematic because people can go to jail for what they did a week ago. We're also concerned about the push for employee drug testing." "There's not a lot of new policies there, and that's disappointing," he said. "This is a drug policy on autopilot; it's just a little more aggressive on the marijuana issue." This week marks the 40th anniversary of America's contemporary war on drugs, and the country's largest anti-prohibitionist law enforcement organization is commemorating -- not celebrating -- the occasion with the release of report detailing the damage done. Members of Law Enforcement Against Prohibition (LEAP) hand-delivered a copy of the report, Ending the Drug War: A Dream Deferred, to the Office of National Drug Control Policy (the drug czar's office) Tuesday after holding a press conference in Washington, DC. 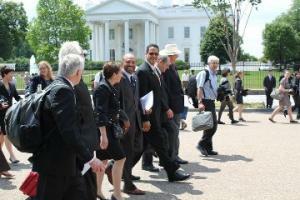 LEAP members pass by the White House as they deliver their report to the drug czar's office. On June 17, 1971, President Richard Nixon (R) declared "war on drugs," and thousands of deaths, millions of arrests, and billions of tax dollars later, drug prohibition remains in place -- the Obama administration's declaration two years ago that it had ended the drug war in favor of a public health-centered approach notwithstanding. Ending the Drug War details how the war on drugs continues unabated, despite the recent administrations' less warlike rhetoric, and the ways it has hurt rather than helped drug users and society at large. "When President Nixon declared the 'drug war' in 1971, we arrested fewer than half a million people for drug offenses that year. Today, the number has skyrocketed to almost two million drug arrests a year," said former Baltimore narcotics officer and LEAP executive director Neill Franklin. "We jail more of our own citizens than any other country in the world does, including those run by the worst dictators and totalitarian regimes. Is this how President Obama thinks we can 'win the future'?" The report shows that despite the drug czar's nice talk about ending the drug war, Obama administration spending priorities remain highly skewed toward law enforcement and interdiction -- and it's getting worse, not better. In 2004, the federal drug budget was 55% for supply reduction (policing) and 45% for demand reduction (treatment, prevention). In the 2012 Obama budget, supply reduction has increased to 60%, while demand reduction has shrunk to 40%. The report also demonstrates through arrest figures that on the street level, the drug war continues to be vigorously waged. In 2001, there were almost 1.6 million drug arrests; a decade later, there were slightly more than 1.6 million. Granted, there is a slight decline from the all-time high of nearly 1.9 million in 2006, but the drug war juggernaut continues chugging away. "I was a police officer for 34 years, the last six as chief of police in Seattle," retired law enforcement veteran Norm Stamper told the press conference. "At one point in my career, I had an epiphany. I came to the appreciation that police officers could be doing better things with their time and that we were causing more harm than good with this drug war. My position is that we need to end prohibition, which is the organizing mechanism behind the drug war. We need to replace that system guaranteed to invite violence and corruption and replace it with a regulatory model," he said. 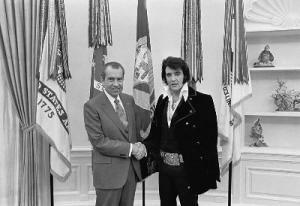 Nixon made Elvis an honorary narc in 1970. Nixon and Elvis are both dead, but Nixon's drug war lives on. LEAP slams the Obama administration for its forked-tongue approach to medical marijuana as well in the report. The administration has talked a good game on medical marijuana, but its actions speak louder than its words. While Attorney General Holder's famous 2009 memo advised federal prosecutors not to pick on medical marijuana providers in compliance with state laws, federal medical marijuana raids have not only continued, but they are happening at a faster rate than during the Bush administration. There were some 200 federal medical marijuana raids during eight years of Bush, while there have been about 100 under 2 1/2 years of Obama, LEAP noted. And LEAP points to the horrendous prohibition-related violence in Mexico as yet another example of the damage the drug war has done. The harder Mexico and the US fight the Mexican drug war, the higher the death toll, with no apparent impact on the flow of drugs north or the flow of guns and cash south, the report points out. Sean Dunagan, a recently retired, 13-year DEA veteran with postings in Guatemala City and Monterrey, Mexico, told the press conference his experiences south of the border had brought him around to LEAP's view. "It became increasingly apparent that the prohibitionist model just made things worse by turning a multi-billion dollar industry over to criminal organizations," he said. "There is such a profit motive with the trade in illegal drugs that it is funding a de facto civil war in Mexico. Prohibition has demonstrably failed and it is time to look at policy alternatives that address the problem of addiction without destroying our societies the way the drug war has done." Ending drug prohibition would not make Mexico's feared cartels magically vanish, LEAP members conceded under questioning, but it would certainly help reduce their power. "Those of us who advocate ending prohibition are not proposing some sort of nirvana with no police and no crime, but a strategy based in reality that recognizes what police can accomplish in cooperation with the rest of society," said former House Judiciary Crime subcommittee counsel Eric Sterling. "The post-prohibition environment will require enforcement as in every legal industry. The enormous power that the criminal organizations have will diminish, but those groups are not going to simply walk away. The difference between us and the prohibitionists is that we are not making empty promises like a drug-free America or proposing thoughtless approaches like zero tolerance," he told the press conference. Drug prohibition has also generated crime and gang problems in the US, the report charged, along with unnecessary confrontations between police and citizens leading to the deaths of drug users, police, and innocent bystanders alike. The report notes that while Mexico can provide a count of its drug war deaths, the US cannot -- except this year, with the Drug War Chronicle's running tally of 2011 deaths due to US domestic drug law enforcement operations, which the report cited. As of this week, the toll stands at four law enforcement officers and 26 civilians killed. It was the needless deaths of police officers that inspired retired Maryland State Police captain and University of Maryland law professor Leigh Maddox to switch sides in the drug war debate, she said. 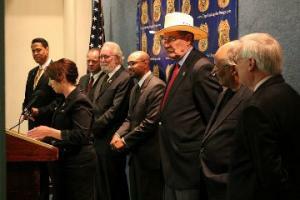 LEAP's Leigh Maddox addresses the Washington, DC, press conference Tuesday. "My journey to my current position came over many years and after seeing many friends killed in the line of duty because of our failed drug policies," she told the Washington press conference. "This is an abomination and needs to change." While the report was largely critical of the Obama administration's approach to drug policy, it also saluted the administration for heading in the right direction on a number of fronts. It cited the reduction in the sentencing disparity for crack and powder cocaine offenses and the lifting of the federal ban on needle exchange funding as areas where the administration deserves kudos. Forty years of drug prohibition is more than enough. Police are getting this. When will politicians figure it out? US Drug Czar Supports Venezuela Shooting Down "Drug Planes"
Over the weekend, Venezuelan President Hugo Chavez said his country should consider shooting down drug-carrying planes. 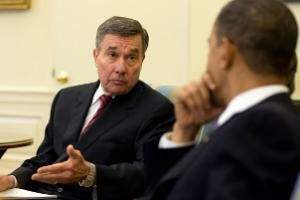 On Tuesday, US drug czar Gil Kerlikowske seemed to signal his approval of the idea. Chavez told lawmakers Saturday he is considering letting the military shoot down drug-laden planes if they ignore orders to land. 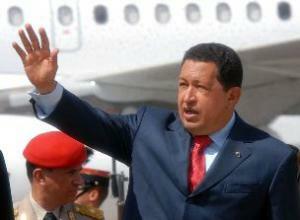 Drug smugglers often ignore military orders to land and sometimes mock those orders over the radio, Chavez said. He added that he doesn't necessarily like the idea of shooting down planes, but that parliament should debate it. Although no coca is grown in Venezuela, the country has become a major hub for drug traffickers smuggling Colombian cocaine. The Venezuelan government has been criticized by the US over the use of its territory by drug traffickers, but Venezuela contends that despite its lack of cooperation with the DEA, it is doing all it can to stifle the trade. 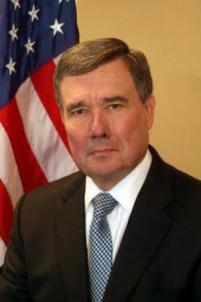 US drug czar Kerlikowske was in Colombia on a three-day trip when he commented on Chavez's remarks. "Venezuela has expressed clearly its support for curbing drug trafficking by air," he said, adding that other countries in the region should adopt similar measures. The US supported a similar program in Peru beginning in the Clinton administration and even provided CIA and military personnel to support it. But that program came to a crashing halt after a Peruvian Air Force fighter jet shot down a plane carrying American missionaries in 2001, killing Veronica Bowers and her infant daughter. In the middle of this year, the Costa Rican Parliament authorized the arrival of 7,000 soldiers, 46 war ships, more than 200 helicopters, 10 Harrier planes and two submarines. The permission provoked the rejection of various parties and social sectors, regarding it as anti-constitutional and violating national sovereignty. "We are quite much worried with such an excessive military force to fight drug trafficking," said Victor Emilio Granados, from Partido Accesibilidad sin Exclusion (PASE) - Accessibility without Exclusion Party. Other parties such as Frente Amplio and Accion Cuidadana also rejected the US military presence. In San Diego's Otay Mesa industrial area, warehouses may be housing cross-border tunnels used to smuggle huge amounts of drugs from Tijuana, Mexico. After two major underground passages were discovered last month less than two blocks from one of nation's busiest border crossings for cargo, federal authorities are knocking on doors of warehouse owners and tenants to ask for help. In the city of Chihuahua, two Ciudad Juarez attorneys and a companion were executed after being snatched off a street by an armed commando. The two men were in Ciudad Juarez to investigate a case for a client they represent who faced federal charges. In Tamaulipas, 11 suspected members of the Zetas Organization were killed during a clash near the town Nueva Ciudad Guerrero. The firefight occurred after soldiers on patrol came under fire. Two other gunmen were captured and nine rifles were seized, as well as four handguns, a grenade launcher and body armor. In Ciudad Juarez, five people were murdered across the city. Among the dead was a municipal policeman who was gunned down on his day off. He is the 55th municipal police officer killed this year. In total, 130 policemen from the various law enforcement bodies that operate in Juarez have been killed so far in 2010. In Mexico City, authorities began the process to extradite Edgar Valdez Villareal, better known as La Barbie, to the United States. Valdez, 37, was a high ranking lieutenant in the Beltran-Leyva Organization before being captured in August. He is charged in a 2002 indictment in Louisiana and a 1998 indictment in Texas, both for his involvement in cocaine trafficking. Valdez is a US national, as he was born in Laredo, Texas. In Colima, a former state governor was shot and killed at his home. His wife was wounded in the attack. Cavazos left office in November 2009. He is one of several governors, ex-governors and gubernatorial candidates killed in Mexico in the last few years. Colima has been relatively free of the rampant drug-related violence seen in other parts of the country. The state Secretary of Economic Development, who was visiting Cavazos at the time of the attack, was also wounded in the incident. In Tepic, Nayarit, five suspected drug traffickers were shot and killed during a series of firefights across the city. The incident began after soldiers began chasing a vehicle with armed men aboard. One gunman was captured in the incident, and two soldiers were wounded. In Colima, police accidentally shot dead a doctor during an operation to find the killers of ex-governor Cavazos. In Brownsville, Texas, border patrol agents seized over 700 pounds of marijuana in the remote Flor De Mayo area of the city, which is located off Highway 281 and is just across the Rio Grande. The area is a well-known crossing point for drugs coming from Tamaulipas.